A flow meter installed at the head of a microirrigation system or small flow meters placed at the head of selected lateral lines can help you detect clogging. Saddle-mount propeller meter installed at the head of a drip system. Note the instantaneous (gpm) and totalizing (gal) registers. Photo: L. Schwankl. 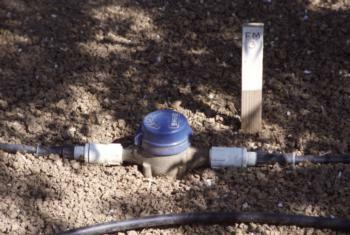 A single, large flow meter at the head of the microirrigation system monitors the flow rate to the entire system. Most flow meters incorporate a totalizing register that records the total flow (gallons, cubic feet, acre-inches, etc.) passing through the meter. 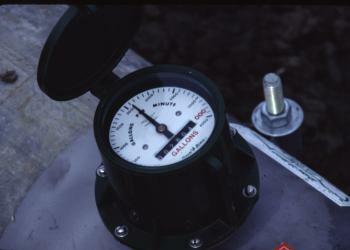 Some meters also have an instantaneous flow rate indicator (measured in gallons/min (gpm), cubic feet/sec (cfs), etc.). The most reliable information comes from noting the change in the totalized flow value for a known time period. For example, if a flow meter measured 30,000 gallons passing through it in 1 hour, the flow rate would be 500 gpm. Make sure that the pipe in which you install the flow meter is installed is flowing full and that there is not excessive turbulence in the pipe. A flow meter installed close to a valve, elbow, or tee may not provide accurate information. If the meter has an instantaneous (e.g. gpm or cfs) indicator, an excessive fluctuation of the indicator needle is an sign of excessive turbulence in the meter. Always install flowmeters in accordance with the manufacturer's recommendations and local regulations. To detect clogging, make a periodic (e.g. daily, weekly, monthly) check of the flow rate in the system. A decrease in flow rate over time may indicate clogging may be occurring. Of course, the microirrigation system must be operating at the same pressure when both flow rates are determined if you want to have accurate, useful data. If you allow the operating pressure to vary, the flow rates will be valid but are difficult to compare from one period to another. Using a number of small flow meters (throat size 5/8” or 3/4”) to monitor flow rate of individual lateral lines provides greater sensitivity to clogging than does a single, large meter at the head of the system. The small flow meters cost $75 to $100 each and are easily installed in the lateral line tubing using standard PVC and drip fittings. They can last multiple years if cared for properly. How many small flow meters should should you use? One meter for every 5 acres is a good compromise between meter cost, resource commitment to read the meter, and quality of information. Most small flow meters have only a totalizing register so you will need to keep track of the system operating time between meter readings. As with the large flow meter, operating pressure needs to stay constant for accurate comparisons over time.